In this podcast episode I’m sharing a book that I’ve recently read and have been telling everyone about. It’s been a real eye-opener for me as it describes one important aspect of who I am and how that helps me be successful plus it points out where I often fail. And, whilst there are thousands of books on the topic ‘What does it take to be successful?’ this book flips conventional wisdom and presents a unique and surprising perspective. 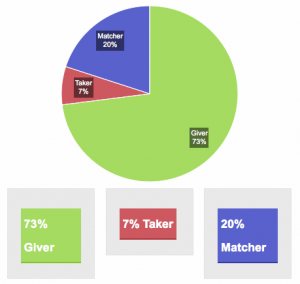 The book is called: Give and Take – A Revolutionary Approach to Success. 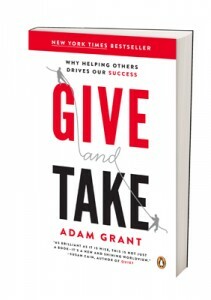 The author is Adam Grant. He’s a Wharton Business School Professor and Organisational Psychologist. The book website – includes a 5 minute 15 question profiling tool to find out your preferred style (see my example above). You can also download Chapter 1 for free.